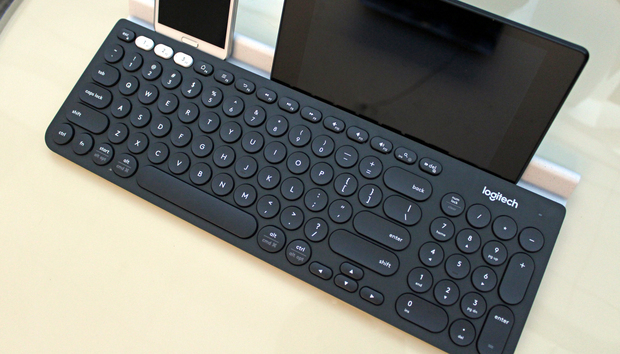 As its name clearly states, Logitech’s K780 Multi-Device Wireless Keyboard promises to be the one keyboard to rule all your computing gizmos. Indeed, it’s fully compatible with Windows, Mac OS, Chrome OS, Android, and iOS—and more importantly, it provides fast and effortless switching between your computer, smartphone, and tablet. This full-size, six row keyboard features a complete set of function keys and a number pad. Certain keys—such as Alt and Ctrl—will automatically change functions depending on which operating system you’re working in. Running the length of the keyboard is a rubberized tray that holds your mobile devices at the correct viewing angle. You can link up to three devices at a time to the K780 via Bluetooth. Those without Bluetooth can connect via Logitech’s Unifying USB dongle. At the top left of the keyboard are three white buttons used to pair your devices. Switching between paired gadgets is as simple as tapping the corresponding button. I loved using this keyboard when I had my MacBook Air hooked up to an external monitor. It sits comfortably flat and the round, concave keys—a nice aesthetic change from most keyboards—have a quiet responsiveness that’s particularly satisfying, especially if you’re a touch typist. It also instantly recognized OS X and converted the key commands accordingly. But let’s be honest: While the K780 works as serviceable substitute for your computer’s native keyboard, its real purpose is to free you from the tyranny of thumb-typing on your mobile device’s touch screens. And at that, it excels. With my iPad or Android phone nestled in the rubber cradle and my fingers flying across the keys, typing documents or text messages was as comfortable as if I were working on my laptop. My only knock against the K780 is that it’s not more portable—it’s about 1.9 pounds (875 grams). To be fair, it’s not advertised as such, but I found it so freeing I wanted to take it everywhere I took my phone and tablet. Still, it’s certainly sturdy enough to handle the travel, so if you can handle the extra weight, don’t hesitate to add it to your gear bag.